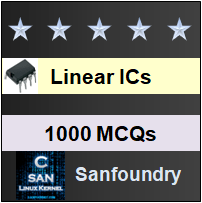 This set of Linear Integrated Circuit Multiple Choice Questions & Answers (MCQs) focuses on “Triangular and Sawtooth Wave Generator”. 1. How a triangular wave generator is derived from square wave generator? Explanation: The output waveform of the integrator is triangular, if its input is square wave. Therefore, a triangular wave generator can be obtained by connecting an integrator at the output of the square wave generator. 2. The increase in the frequency of triangular wave generator. Explanation: As the resistor value increase or decrease, the frequency of triangular wave will decrease or increase, respectively. Therefore, the amplitude of the triangular wave decreases with an increase in it frequency and vice verse. 3. 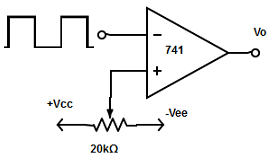 Which among the following op-amp is chosen for generating triangular wave of relatively higher frequency? Explanation: The frequency of the triangular wave generator is limited by the slew rate of the op-amp. 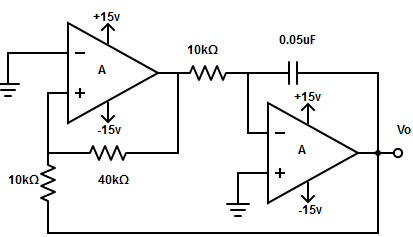 LM301 op-amp has a high slew rate. 4. What is the peak to peak (PP) output amplitude of the triangular wave? + VRamp–> positive going ramp. 5. 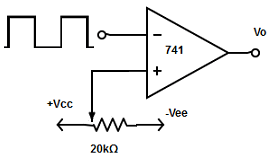 Determine the output triangular waveform for the circuit. = (4×10kΩ×0.05µF×10kΩ) /40kΩ = 0.5 ms.
=> R3 = 0.233×10kΩ = 2.33kΩ. => C1 = 2.33kΩ / (8×10-11) = 2.9 ×10-9 ≅3nF. Explanation: The triangular wave form has rise time of the triangular wave always equal to its fall time, that is, the same amount of time is required for the triangular wave to swing from -VRamp to +VRamp as from +VRamp to -VRamp. Explanation: Sawtooth waveform has unequal rise and fall times. It may rise positively many times faster than it falls negatively or vice versa. 9. 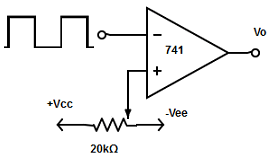 Find out the sawtooth wave generator from the following circuits. Explanation: The triangular wave generator can be converted into a sawtooth wave generator by inserting a variable dc voltage into the non-inverting terminal of the integrator. 10. Consider the integrator used for generating sawtooth wave form. Match the list I with the list II depending on the movement of wiper. Explanation: Depending on the duty cycle (movement of the wiper) the type of waveform is determined.